​This book is soft-cover of 80 pages in 8" x 11 3/4" page format. It comes in a self-sealing clear cello envelope. Kagero is a book publisher based in Lublin, Poland. The book is in English. There is a pair of cardboard 3D glasses inserted in the book. 1. King George V Battleships, British Giants. Author: Witold Koszela. 2. The Sommergibill Under Black Colors. Author: Marek Sobski. 3. The Zulu-Class - The Successors of Katyusha, The Soviet Project 611 Submarines. Author: Jan Radziemski. 4. U.S.S. Harry S. Truman, Multifunctional Taskforce in the Arabian Sea. There are 7 black and white photos in the book. A 2-view black and white drawing of King George V.is included. A line-drawing of the sturn of King George V and two 2-view cut-aways and 26 single cut-aways of it. Also, one color photo of it, a 3-view cut-away and a 3-v color illustration. A color 2-view of the Prince of Wales. A color 3-view of a Walrus Mk.I aircraft with a 5-view line drawing. Italian submarines "Fratell Bandiera" and "Vittor Pisoni" black and white photos. A black and white photo of "Ruggiero Settimo", "Bonzo", "Nichelio", "Platano", "Sirena", "Asteria", "Voltice", "Nereide", "Romolo", "Remo", "Rismondo", "Bajamondo" and "Brin". Seven 3D color illustrations of H.M.S. Barham and 2 black and white photos. Color illlustrations of Soviet submarines B-80, B-61, 99, B66 "Lira", two of 37. Eight cut-away line drawings of a Zulu Chass ship. 3 color 3D 4-views of Soviet "Burza" Destroyer. Color photo of a SH-60F helicopter, F-18's, Super Hornet, EA-6B Prowler. An advertisement showing the cover arts of 14 other Kagero books. A color 3D 3-view of "Lutzow" Cruiser. 10 colpr 3D walk-around illustrations of the "Lutzow" (2 on the back cover) Also below the 2 on the back cover is black and white photos of King George V Battleship, an Italian Sub, a Russian sub and U.S.S. Harry S. Truman Carrier. 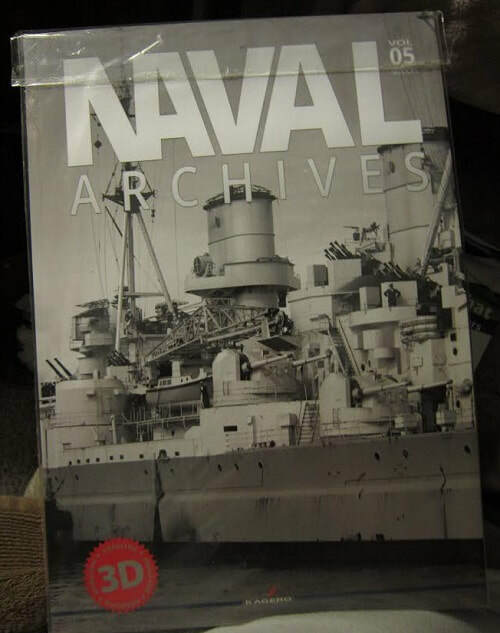 This is a nice book about these naval subjects. I want to thank the folks at Casemate Publishing for this review sample and Kagero also.